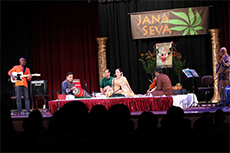 In partnership with Jana Seva Inc. NY and the Cleveland Aradhana Committee, Padmashri Sudha Ragunathan, along with Jazz Fusion Music wizard Amit Heri presented Morning Raga in eight venues in the United States of America. The concert tour was a fund raiser and the proceeds would be utilized to fund charity causes such as orphanages and old age homes in India. The passion and experience of Sudha, with her golden voice, mixed with the dexterity of Amit Heri on the lead guitar, and the musical creativity of other leading musicians, created an eclectic and enigmatic fusion of modern and classical music that enthralled the audience. The music appealed across all ages and minds and has received a standing ovation in the venues.